I was going to start off by saying that today was one of those days for more pictures and a little less writing but then I decided that although a picture might be worth a thousand words, they might leave you wondering about all the curious little details. There is nothing better than picking and eating grapes right off the vine. It is impossible to resist sneaking a bunch when they grow right beside the trail. There are no fences and the grapes are so sweet and delicious because it is almost harvest time. A few hours after we ate the grapes, we heard from a new friend that they spray the vineyards with something toxic. Oops! “When did you eat those grapes? Four hours ago? Then I guess you are safe!” Whew! It was such a peaceful walk along gently rolling farmland and vineyards today. Even though it was a long walk, it wasn’t difficult because we were walking on natural track and the temperature was just right. Those things make a huge difference. 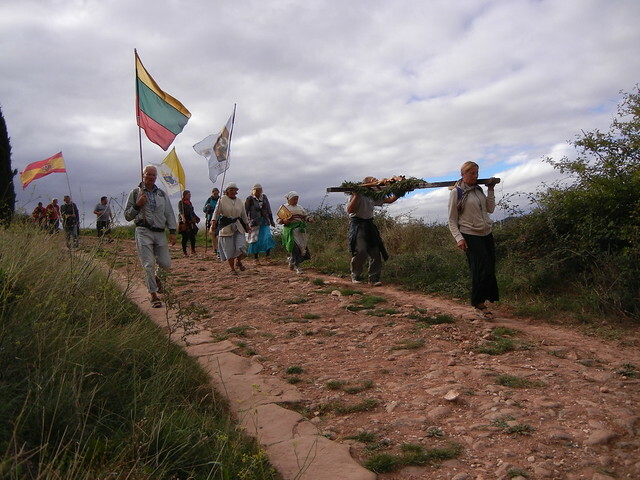 We shared the trail with an interesting group of Lithuanian people who were walking in a procession, carrying Jesus on a cross and a statue of the Virgin Mary. They were wearing unusual clothes, chanting, and waving big flags. We don’t know how far they intend to walk, but they do have a bus, although it might just be for sleeping in. 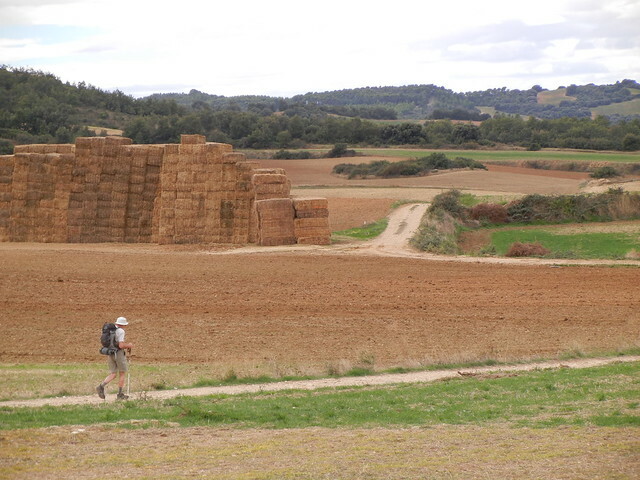 After 7.8 km we came to a medieval village of Cirauqui perched on a hill. It could be seen from quite a distance and was so picturesque. 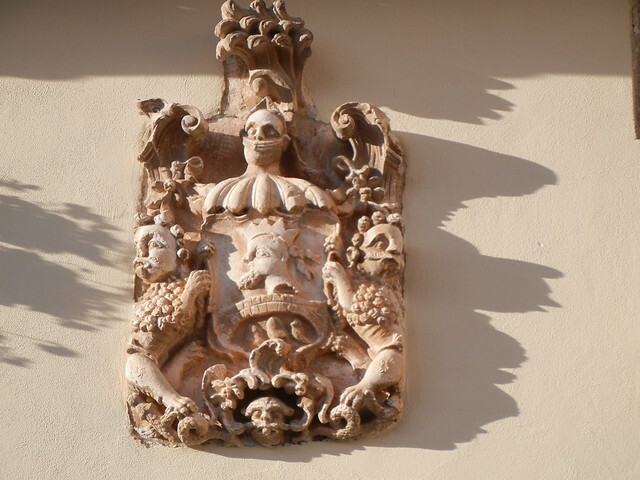 It is beautifully preserved with narrow winding sreets and houses bearing armorial crests and ornate balconies. We didn’t stop for cafe con leche and snack here as many peregrinos did, but instead went into a super mercado in Cirauqui to buy some bread, cheese, yogurt, and apples, our standard breakfast/lunch to eat on the trail. 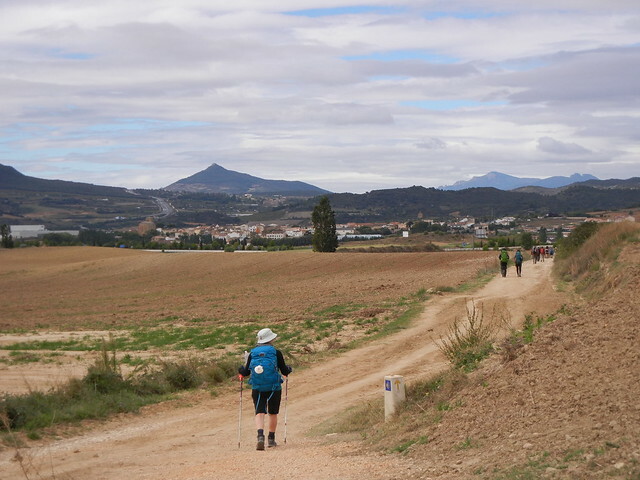 After leaving Cirauqui, we walked on one of the best examples of 2,000-year-old Roman road on the Camino and then over a famous medieval stone bridge which has been restored. It was a good place for peregrinos to cool their hot feet. I would have liked to stay the night at La Casa Magica Albergue in Villatuerta Puente, one of Tania’s favourite places, but there are no private rooms which is Dave’s preference. 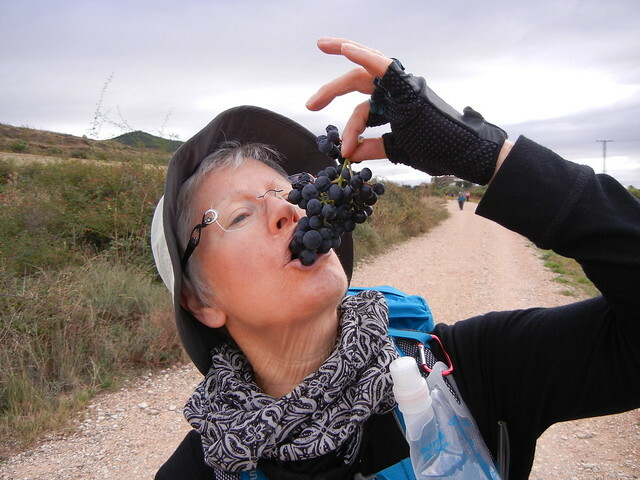 We decided to continue walking to Estella, instead, where we booked into a lovely attic room at “B&B Zaldu.” Actually it should have been called “B Zaldu” since there was a bed with no breakfast. We really have nothing to complain about, though, because we have sheets, towels/bath sheets, and (drum-roll, please) a hair dryer! There were some interesting sites to see in Estella, such as the XIIth Century Palace of the Kings of Navarre and the Church of San Pedro de la Rua, but when you are as hungry and tired as we are, we can only think “FOOD”and “BED” and shelter from the torrential downpour that threatened to drown us on our way from the restaurant. On the subject of food, we both ordered hamburgers. It was very delicious meat, perfectly seasoned, and it came with good fries with lots of salt which we probably need since we work up quite a sweat on our hikes. What was missing were tomatoes, lettuce, cheese, pickle, or a bun. A sliced baguette in a basket appeared on the table for an additional charge. Water was also an extra charge. A sample pilgrims meal usually consists of: wine or water, bread, salad or a pasta, meat/chicken/fish and fries, and dessert that includes ice cream (our choice) and usually costs 10 Euros. They are big meals because they know peregrinos are very hungry people!